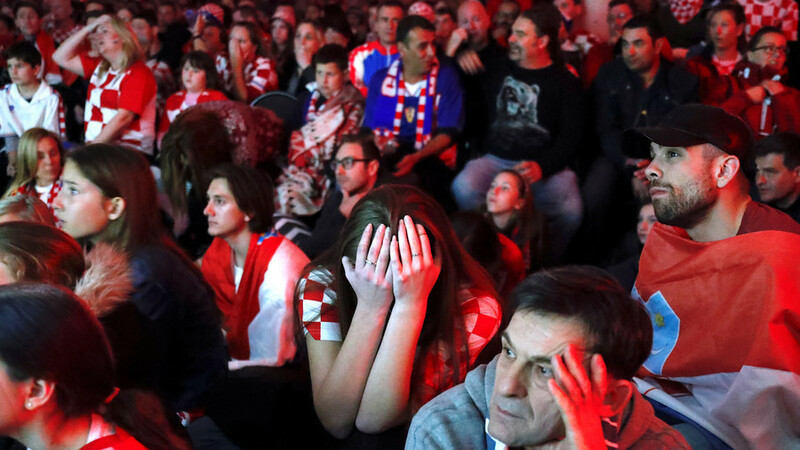 World football governing body FIFA released figures showing that fewer Croatian football fans tuned in to watch the nation’s first ever World Cup final on Sunday than the team's semifinal win versus England. Croatia achieved their first ever final appearance with a 2-1 extra time victory over England in the semifinal match, which was watched by 1.538 million viewers on national broadcaster HTV2. Astonishingly, that number was higher than the crowd who watched the tiny Balkan nation take on France in the final in the same stadium on Sunday, with just 1.538 million viewers registered. Croatia has a population of just 4.17 million people, and the percentage of the population that watched the nail-biting semi with England, witnessed the country become the smallest nation since 1950 to reach a World Cup final. French channel TF1 recorded an average of 19.34 million for the final, equivalent to 33.2% of the potential television audience in France and peak viewership of 22.21 million viewers for the award ceremony. Those who did watch the final, inside the stadium and in front of the TV set, watched Zlatko Dalic’s "Vatreni" go down 4-2 to France, who won their second World Cup in the space of 20 years after clinching their maiden title at their home championships at France 98. They would have also seen Croatia president Kolinda Grabar-Kitarovic soaked by the downpour after the final at Luzhniki emotionally thanking each player, including captain Luka Modric, who won the Golden Ball as the tournament’s best player.